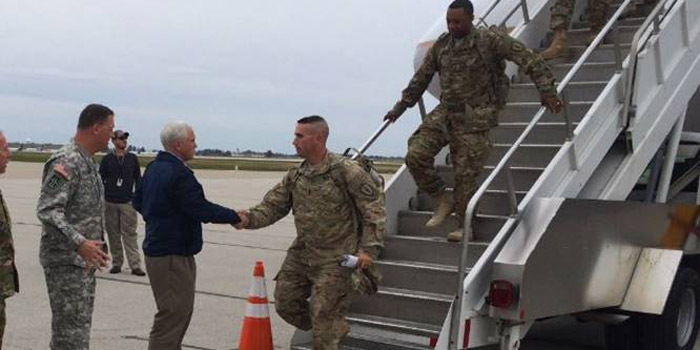 Governor Pence and The Adjutant General, Major General Corey Carr, welcome soldiers of the 1313th Engineer Company home to Indiana after their service in Kuwait. INDIANAPOLIS — Gov. Mike Pence Monday, Nov. 2, joined The Adjutant General of the Indiana National Guard, Major General Corey Carr, to welcome home approximately 160 soldiers of the 1313th Engineer Company, headquartered in Franklin. The 1313th Engineer Company returned after serving the last nine months conducting engineering operations in Kuwait to support the ongoing drawdown of Operation Enduring Freedom. Photos of the Governor welcoming home these Hoosier heroes will be posted on the Governor’s Flickr. The Indiana National Guard also hosted a homecoming ceremony for the 1313th Engineer Company Guardsman and their family and friends at the 38th Infantry Division Headquarters in Indianapolis.